Gastric submucosal tumors are often treated by laparoscopic wedge resection. This study aimed to examine the feasibility of performing gastric full thickness resection through a totally endoscopic approach using the MASTER (Master and Slave Transluminal Endoscopic Robot), a novel robotic endosurgical system with two slave manipulators, a grasper and an electrocautery hook deployed through a dual channel endoscope and controlled by surgeon through an intelligent human-machine interface. The operation was performed in two live porcine models under general anesthesia using the MASTER. Firstly, the anterior wall of the stomach was slung to the abdominal wall using percutaneous suturing device. An imaginary lesion of 5cm was first marked using needle knife. After initial mucosal incision was then made using IT knife, the MASTER was introduced through a long overtube. 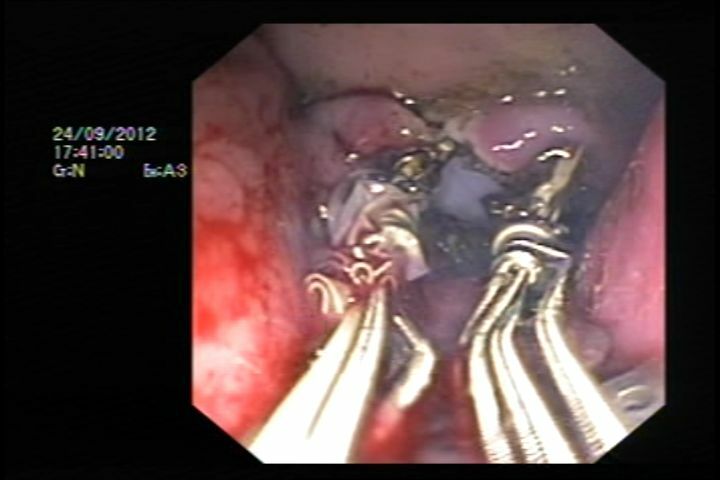 A circumferential mucosal incision was completed with the MASTER to expose the muscularis propria which was grasped and incised to the serosal layer by electrocautery applied through the hook of the MASTER. The full thickness resection of the gastric wall was completed with retraction using the grasper and dissection using the hook. While the defect was being created, the luminal space was maintained with traction of the percutaneous sutures. The defect was closed with suture plication using Apollo Overstitch device. Two full thickness gastric resections were performed in two non-survival porcine models with body weight of 30kg and 35kg respectively using the MASTER. The total procedural time was 56 minutes for the first model, and 70 minutes for the second model. The luminal view was maintained during the whole procedure, and there was no damaged to surrounding organs throughout the whole procedure. The gastric defects were successfully closed using Overstitch with satisfactory gastric distension and no gas leakage afterwards. The current experiment demonstrated the feasibility and safety of a total endoscopic approach for treatment of gastric submucosal tumors – full thickness resection of with MASTER and successful closure of the defect using Overstitch. This serve as important foundation for further clinical trial.